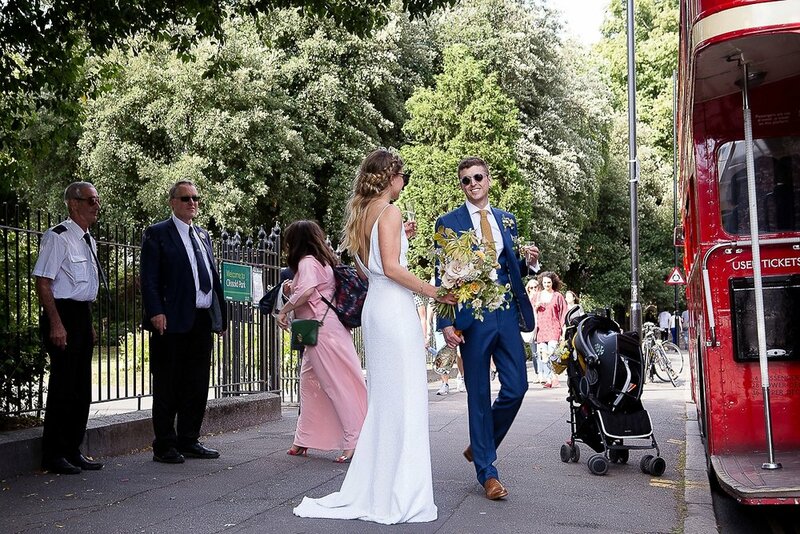 This Brit babe with a minimalist heart married the love of her life, Matt, right in Central London complete with a red London bus, a squad of babes dresses in white, and a relaxed, carefree vibe. Fallyn is the quintessential &FL bride, pairing our incredible sequined BROOKLYN gown with a cool geometric headpiece, a long lariat necklace worn backwards, and gold Guissppe Zanotti heels. 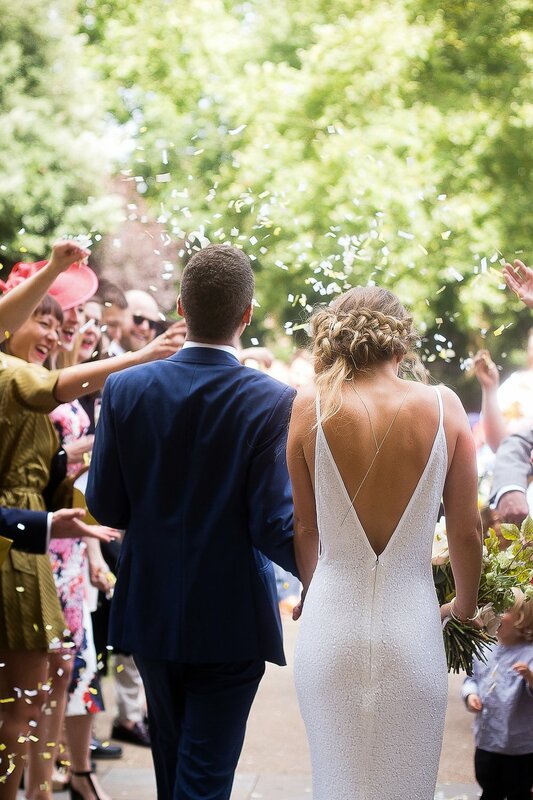 Move over Kate Moss, this wedding is officially the coolest one in London. We are pretty relaxed and wanted that to be reflected in our wedding which we shared with family and close friends. I think I knew very early on when he took me out dancing. I'd never been on a date with someone who really danced with me - and I love to dance! He was intelligent and made me laugh every day. I think we both make each other better in some way. I must have tried on about 25 different wedding dresses during the search and all of them were lovely in some way. The only thing I was absolutely sure of was that I wanted something that was different, less-formal and not at all fussy. If i'm brutally honest i wanted a dressed that would make people and particularly Matt go - "WOW" when i walked down the aisle. My style in general is fairly minimalist so i felt really uncomfortable in anything too "wedding-y". I do however absolutely love sparkles. When i tried on the Brooklyn i was sold - it combined all the things I wanted. Describe your wedding- any inspiration or themes were your drawn to when planning? What was the vibe? From the very beginning every single article I read asked about "themes". My feeling at the time was that surely getting married was theme enough! It hadn't occurred to me that i needed one. However, as time went but it became very clear that a theme was emerging without me even realising. I am absolutely obsessed with geometric shapes and anything gold and sparkly. Every piece of decor i decided on or accessory i chose seemed to hint at as much. 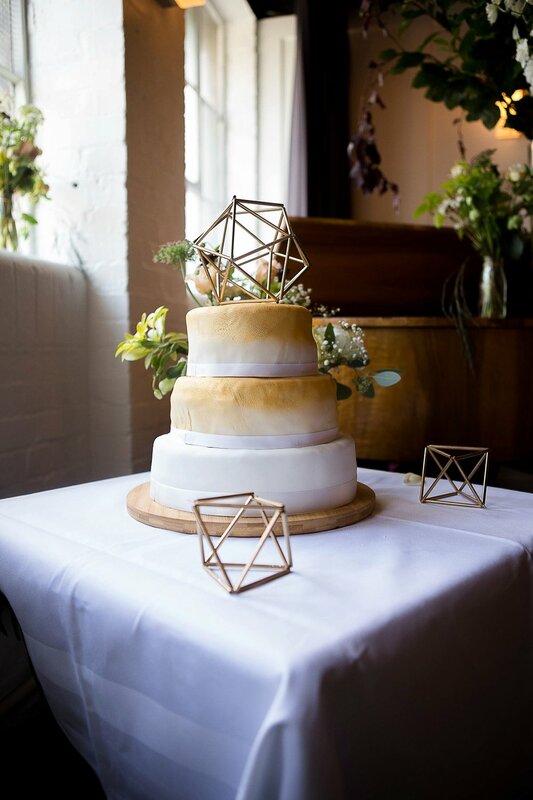 So in the end I think the theme was golden and geometric as you'll probably see in the photos. The whole day itself was without a doubt the best day of our lives. People tell you that it will be but I don't think you ever really appreciate how special it is until you're there. It was incredibly emotional and there were a lot of tears but it was so wonderful to stand there in front of all your closest friends and family and promise to spend your lives together. It was a whirlwind so I think my favourite moment was just after the ceremony. The photographer told us to hide away once we exited the ceremony and take a few minutes alone together before the big confetti moment. That was really special to spend a few moments just us taking it all in before rejoining the party. I will inevitably be a very stressful time in the run up to the big day and at times i think i did get too obsessed with the little things. I think the best decision I made was to delegate as much as possible in those last few days. In the 3 or 4 days before the wedding I invited all the bridesmaids and groomsmen for dinner and then on another day all the parents. This was a really nice way to talk everyone through all the jobs to be done and the running order for the day. Then I emailed everyone so they all knew where to be and what they needed to do etc. It sounds super boring but it meant that in the 36 hours before the wedding I had relinquished control for these things to a number of very trustworthy people. 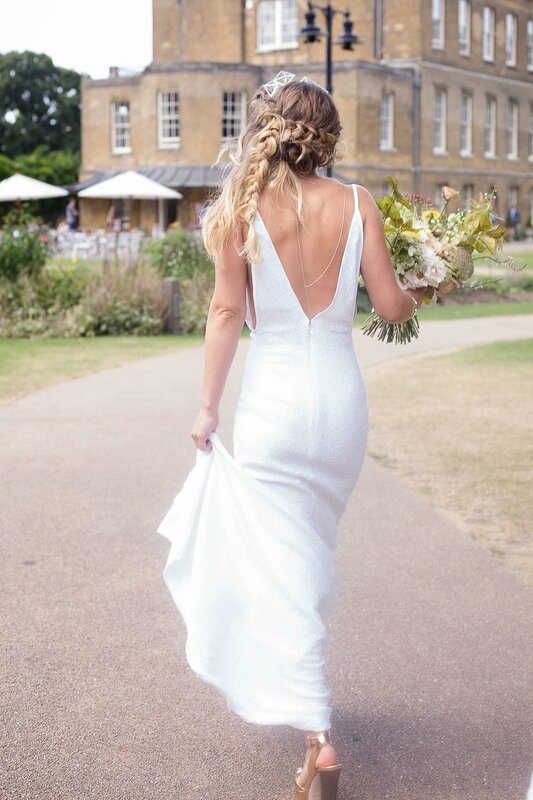 I was much more able to relax and this meant I really enjoyed the day before the wedding and spend the time doing some nice relaxing things with mum, bridesmaids and got a couple of good nights sleep before the big day! A lot of people ask this - day to day things are very similar to how they were before the big day but every now and then you remember that you got to marry the love of your life. You remember little magical moments from the day. Probably most importantly your start planning your future together as husband and wife.